After leaf spots appear, infected leaves rapidly turn yellow and die. Cause Botrytis polyblastis (sexual: Botryotinia polyblastis), a fungus that survives as sclerotia on plant residue in soil. In the spring, these sclerotia produce apothecia and ascospore infection is limited to the flowers. The Botrytis stage then sporulates on infected flowers with conidia blown by the wind to foliage. Initial leaf infections are from spores produced on these infected flowers. Sclerotia are then produced in the dead foliage. 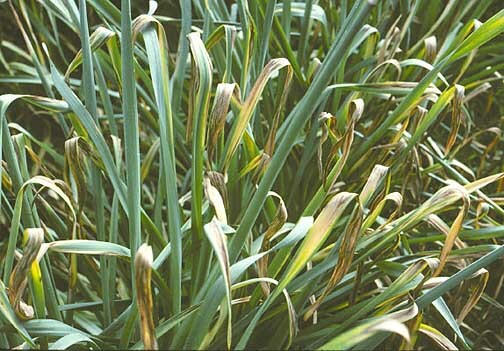 The disease is infrequent and sporadic but can destroy all foliage in late spring, reducing bulb yields and subsequent flower production. Symptoms Flowers are affected first. Edges show water-soaked areas that enlarge, turn brown, and wither. Leaf symptoms consist of small, elongated, grayish spots that enlarge and turn brown. Shortly after spots appear, leaves begin to yellow and die. All foliage may be destroyed within a couple of weeks under favorable (warm and moist) conditions. Cultural control Focus on cultural tactics, especially de-heading and removal of flowers in production fields. Rotate out of daffodils for 2 years. Remove all flowers in tight bud before they become infected. Chemical control Best when used with cultural controls. Make two (2) applications, in late March and early April. Tank-mix or rotate fungicides from different groups that have different modes of action for resistance management. Astun at 10 to 17 fl oz/100 gal water. Group 7 fungicide. 12-hr reentry. CuPRO 5000 at 1.5 to 5 lb/A. Group M1 fungicide. 48-hr reentry. Chipco 26019 N/G at 1 to 2.5 lb/100 gal water. Group 2 fungicide. Good control. 12-hr reentry. Daconil Weather Stik at 1.4 pints/100 gal water. Group M5 fungicide. 12-hr reentry. Decree 50 WDG at 0.75 to 1.5 lb/100 gal water. Group 17 fungicide. 12-hr reentry. Fore 80 WP at 1.5 lb/100 gal water. Group M3 fungicide. 24-hr reentry. Medallion WDG at 2 to 4 oz/100 gal water. Use with oils or adjuvants may cause plant damage. Group 12 fungicide. 12-hr reentry. Pageant at 12 to 18 oz/100 gal water. Group 7 + 11 fungicide. 12-hr reentry. Palladium at 4 to 6 oz/100 gal water. Avoid excessive runoff to small plants, which may result in stunting and/or chlorosis. Group 9 + 12 fungicide. 12-hr reentry. Spectro 90 WDG at 1 to 2 lb/100 gal water. Group 1 + M5 fungicide. 12-hr reentry. Thiophanate-methyl-based products. Tank-mix with another product. Group 1 fungicides. 12-hr reentry. Cleary's 3336 EG at 12 to 16 oz/100 gal water. OHP 6672 4.5 F at 10 to 14.5 fl oz/100 gal water. Reference Chastagner, G.A. 1983. Nacrcissus fire: Prevalence, epidemiology and control in western Washington. Plant Disease 67:1384-1386.